On the 14 April 1998 a 27 year old male motorcyclist was involved in a road traffic accident in the early hours of the morning, when he hit a bus and went underneath it. He was found to be slightly confused at the scene of the accident and was complaining of pain in the front of his neck. He was breathing spontaneously. On arrival to the accident and emergency (A&E) department in Grimsby at 0600 he was fully conscious and orientated and had a Glasgow Coma Score of 15/15. He was breathing spontaneously with tachypnoea (45 per minute). The airway was clear. His pulse rate was 92 per minute and blood pressure was 160\104 mm Hg. He had a 3 cm long laceration over his chin. There was normal air entry on both sides on his chest. There were no signs of head injury or any other associated injuries. He arrived with a hard collar around his neck and was given oxygen 10 litres per minute and using a facemask and intravenous fluids were given. His oxygen saturation remained at 80% despite giving oxygen. After arrival to A&E the patient became more agitated and oxygen saturation had decreased to 79% and he developed obvious surgical emphysema in the neck. Endotracheal intubation with rapid sequence induction was considered, however, pre-oxygenation has failed to improve his oxygen saturation; in fact it deteriorated to 75%. It was impossible to visualise the laryngeal opening with failure to intubate the patient; the airway was almost completely obstructed. Cricothyroidotomy and mini-tracheostomy were attempted but failed to establish any airway. A tracheostomy incision was performed but the trachea was not identified and there was gross swelling and surgical emphysema in the soft tissue of the neck. The patient's condition deteriorated and he soon arrested. Cardiopulmonary resuscitation was started immediately. Radiological examination of the neck revealed the presence of air in the soft tissue planes with an increased pre-vertebral soft tissue space over the maximum normal of 5 mm opposite the third cervical vertebral body (figs 1 and 2). The chest radiograph showed air in the mediastinum (pneumomediastinum) and in the pericardial sac (pneumopercardium) (fig 3). Pericardiocentesis was performed: 50 ml of blood and 300 ml of air were aspirated with some improvement in the vital signs. 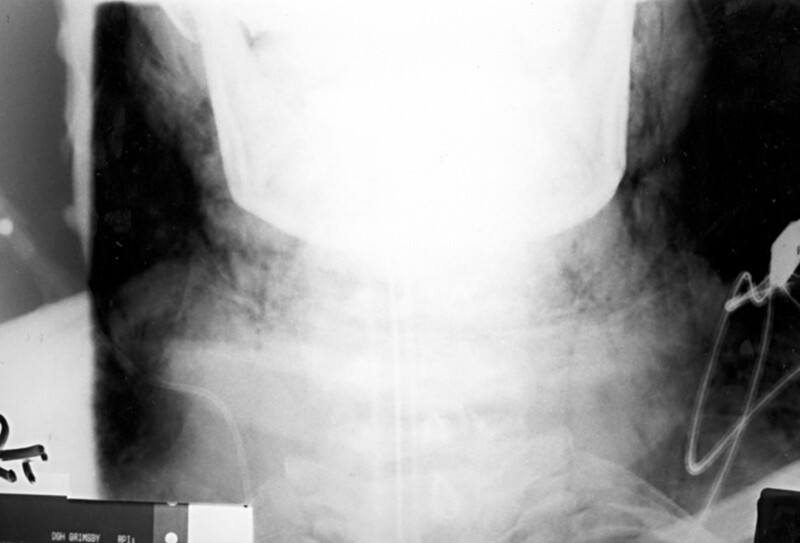 A second attempt to intubate the patient also failed and a bougie was introduced. However, the anaesthetist felt an obstruction to free passage of the bougie. At this stage further dissection in the neck located the completely divided trachea, which had retracted inferiorly in the neck. An endotracheal tube (with a bougie) was guided by hand, through the tracheostomy incision, into the distal trachea and the airway was established and ventilation resumed. However, the patient remained unconscious with fixed dilated pupils. Magnetic resonance imaging of the brain and neck was carried out that showed brain oedema with multiple areas of abnormal signs, suggesting anoxic damage but no signs of any bleeding. There was also pre-vertebral gas shadow in the neck but no damage to the cervical spine. Two sets of brainstem tests were carried out on two consecutive days after admission, which confirmed brain death. Postmortem examination of the body showed the presence of fractures of the laryngeal cartilages with almost complete transection of the upper airway just below the larynx. Lateral view of the cervical spine: showing a wide prevertebral space (over 5 mm opposite the third cervical vertebra), with air in soft tissue planes. AP view of the neck: showing air in the soft tissue planes (surgical emphysema). Chest radiograph showing air in the mediastinum (pneumomediastinum) and in the pericardium (pneumopericardium). The case we are reporting is an example of a high energy blunt trauma to the neck that can be rapidly lethal if the damaged airway is not diagnosed early. Therefore, the most experienced member of the trauma team must take responsibility for airway management—with inline stabilisation of the neck. Endotracheal intubation should be attempted in cases with tracheal injuries except in massive maxillofacial injuries and will be successful in the vast majority of cases. Even when there is a complete disruption of the trachea with distraction of the distal end of the trachea into the superior mediastinum, endotracheal intubation can be achieved using a flexible bronchoscope to guide the endotracheal tube along the bronchoscope into the distal end of the trachea to establish the airway.2 Tracheostomy should be performed only after failure of endotracheal intubation. The damaged trachea should be repaired in theatre with appropriate antibiotic and tetanus prophylaxis after stabilising the patient in the resuscitation room. We would like to thank Chris Rhodes for her support in typing this paper and Dr Ngoma, consultant radiologist, for his comments on the radiological findings. Coventry BJ, Peacock MJ. Survival after traumatic complete transection of the trachea. Aust N Z J Surg1997;67:388–90. Robert B, Lee MD. Traumatic injury of the cervicothoracic trachea and major bronchi. Chest Surg Clin North Am1997;72:285–304. Baumgartner FJ, Ayres B, Theurer C. Dangers of false intubation after traumatic transection. Ann Thorac Surg1997;63:227–8. Chitre VV, Prinsley PR, Hashmi SMH. Pneumopericardium: an unusual manifestation of blunt tracheal trauma. J Laryngol Otol1997;111:387–8. Rossback MM, Johnson SB, Gomez M A, et al. Management of major tracheobronchial injuries. A 28 year experience. Ann Thorac Surg1998;65:182–6. Offiah CJ, Ednres D. Isolated laryngotracheal separation following blunt trauma to the neck. J Laryngol Otol1997;111:1079–81.